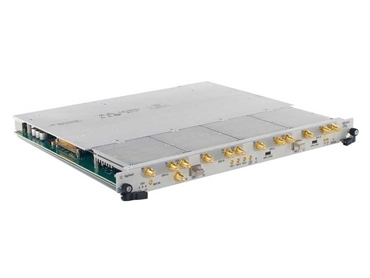 Agilent Technologies introduces the high-speed M9703A eight-channel, 12-bit digitizers designed to comply with the AXIe open standard for use in large-scale applied physics applications. Ideal for large-scale system configurations that pack 40 channels within a single 4U Agilent M9505A AXIe chassis or 80 channels into just 8U of rack-mount space, M9703A digitizers offer twice the channel density of comparable solutions, making them well-suited for challenging experiments in particle physics, nuclear fusion, hydrodynamics and microwave radio astronomy. Didier Lavanchy, Agilent's high-speed digitizer operation manager explains that the new AXIe digitizer drastically simplifies the creation of very dense data acquisition systems that include a large number of high-speed synchronous channels with wide dynamic range. The M9703A AXIe digitizer extends Agilent's portfolio of AXIe based products, and high-speed digitizers modules, which also include solutions in the CompactPCI format. The M9703A includes a comprehensive set of module drivers and a soft-front-panel graphical interface that also supports other Agilent high-speed digitizer products to ease module integration into systems containing Agilent CompactPCI digitizer modules.